I usually end up games-mastering, so a favourite character is a challenge as I rarely get to play over an extended period. One of my earliest characters that I was fond of was a Paladin under (initially) AD&D first edition rules. He wasn't a holier-than-though character, as I modelled him upon a Crusader Knight from one Religious Orders (I think I picked the Hospitallers as they were slightly less dubious to modern sensibilities) blended with the character Sparhawk from David Eddings' Diamond Throne books. He was one of the highest level characters I ever got, reaching at least 9th level. It was a collegiate game with 2-3 GMs. For the life of me, I cannot remember the character's name (Sir Something-or-Other, obviously), but I remember that his arch-nemesis was an Illusionist run by one of the other GMs. The game reached the point that we were starting to carve out kingdoms, and in one case we had a visit to one of the circles of hell. I can also remember the panic we had one battle when we realised that a creature was regenerating all hit points at the end of the round unless we managed to kill it. We were dealing 70-80 hp+ of damage each round and it wasn't enough so we thought we were goners! Somehow we survived. The other thing I remember about the game was that we changed to 2nd Edition AD&D part way through because of the clause in the books that the GM's decision and interpretation was final. We had one player who was very much a power-gamer rules-lawyer so this was a deliberate decision to change the environment to deal with this. So, I suppose I should have a character who has a name for this, so I think I shall have to choose Marcus Inerious. 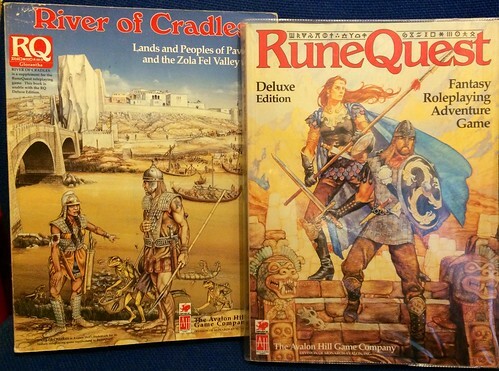 Marcus was a RuneQuest 3 character, a Lunar Centurion placed on Gardening Leave who somehow ended up meshed into a party on their way to become the River Voices in the River of Cradles. We rocked up and down the river, building a small trading empire and having a lot of fun. Duncan R had another Lunar, and Derrick J ran a cracking campaign. My strongest memory was the crazy long range ballistic bowshot Marcus made very early in the campaign, something that helped to mesh him into the group. A great game even when it went a bit mythic every now and again!